Let’s go all “organix” with OGX!! So I thought telling you guys about these beautifully smelling hair care products from a very well know brand ORGANIX or OGX. 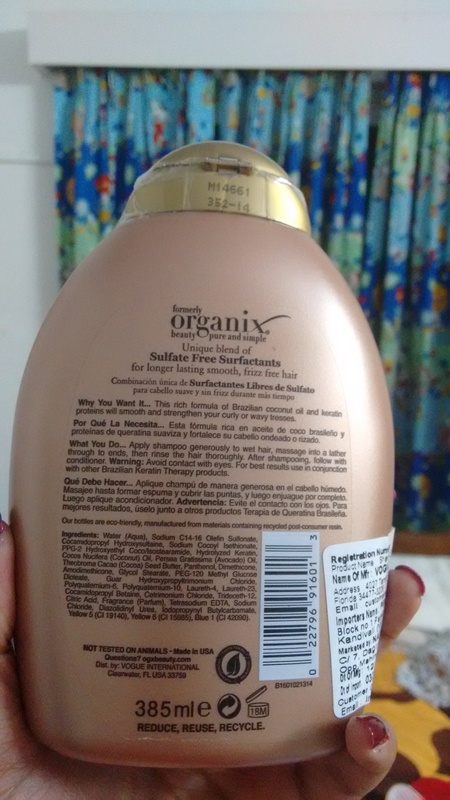 I’ve been reading a lot about OGX on the blogger’s community lately and how my fellow bloggers rave about their brazilian keratin range as well as the argan oil range. I decided to finally give these products a try and ever since I’ve been hooked onto these products. So let’s not keep anymore suspense and review them!! 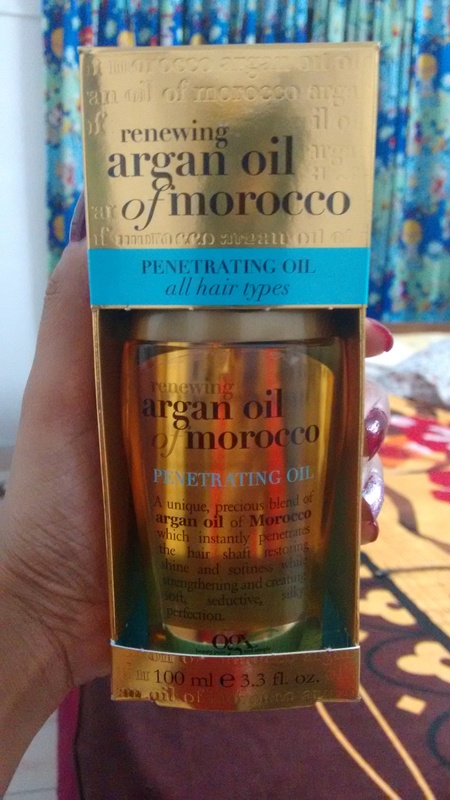 Claims: The Argan oil penetrates, moisturizes, renews and creates softness and strength and also protects hair from harmful styling heat and UV damage. My Experience: I have pretty long straight hair and it can really “knotty” after a shower. LOL!! This stuff does wonders to my hair and helps me remove all the knots really gently and super fast. Though I expected it to be an oil, but the consistency is “serum” like and is not at all sticky or oily. 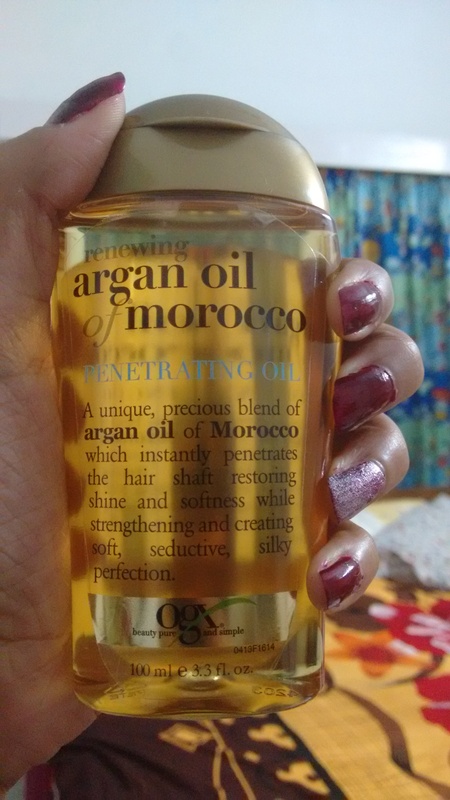 It is advised to use it on towel dried hair and it did wonders to my hair. All I needed was a little bit of the oil for my entire hair and then rubbed it between the palms and applied it from roots to top. I don’t yet know about the strength part, but it definitely gives a sheen to your hair along with a very mild fragrance to it. 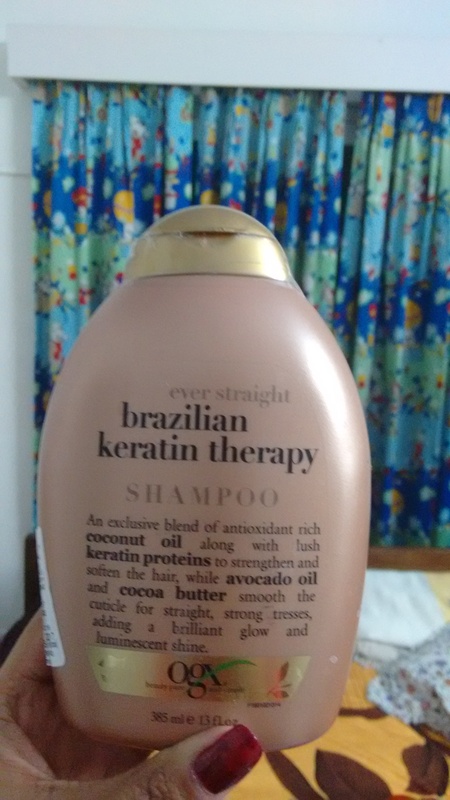 Main Ingredients: Water, cocoa seed butter, keratin, coconut oil, avocado oil, citric acid etc. Claims: The Brazilian coconut oil and keratin proteins smoothens and strengthens curly and wavy hair and provides straight and shiny tresses. I can’t think of anymore bad points for this baby to be honest. Now I know why this product is so raved about everywhere and why is it always out of stock online. So my final verdict would be that this an absolutely amazing product for all those who wish to add some shine to their dry and dead hair. They have a lot of range available for different types of hair and you might want to try them. The links to the website where i got the products from is mentioned below. Heaven in a Mug- Yummy Choco-Nutella mug cake recipe!! I think I’ve tried the macadamia oil OGX range and I had a bad experience with the line. It made my hair extra dry, felt like plastic doll hair. My hair is dry, frizzy, and somewhat fine. It was a bad experience. Glad you had better luck than I did!